If you like stories with zombies in them you may enjoy Unmarked Graves. The story begins in Africa, but the biggest part of it is set in the fictional English town of Darworth. The town has seen a recent explosion of racially motivated crimes and investigative telejournalist Nick Pearson has decided to go to Darworth and do a show about it. Nick needs to complete some preliminary investigations before he can do his show though, and he feels that having a camera crew in tow may put people off talking to him, so he travels to Darworth alone. Nick’s reasoning is sound, but his boss is a little worried about Nick being alone in the town because Nick is black and his colour might make him a potential target. It does not take Nick long to discover the African refugees living in the town distrust the local authorities. They feel they are victimised and think nobody cares. Local thug Stephen Kirkland sees things differently. He thinks the blacks are allowed to get away with murder. Kirkland’s brother was killed by a black man and he tells Nick he believes the police did not investigate the crime as thoroughly as if a white man had been responsible. Detective Sergeant Martin Bishop, on the other hand, denies that the police discriminate in any way. Bishop tells Nick that he is interested in the crimes not the colour of peoples skin. Bishop is an important character in the story and he is kept very busy. When some of the vehicles belonging to refugees are torched during the night, it is Bishop who is put in charge of the investigation. But what starts out as a case of arson becomes a murder inquiry when a body is found in the back of one of the burnt out vans. Matters become further confused when the pathologist’s report reveals the man did not die in the fire. He had already been dead for three months and that there are some strange x-shaped marks carved into the body. It is a good job that the pathologist got to work on the body so quickly because it goes missing a few hours later. The police dust for prints of course, but the only prints that they find belong to members of staff; with one exception: they also find the corpse’s fingerprints. This rather strange incident adds further pressure to the overworked Bishop because he now has a case of body snatching to contend with as well. After Nick discovers the local cemetery has be desecrated, he and Bishop team up and start working together. Strange things have been done with the corpses and some of them bear similar marks to those discovered on the corpse from the burnt out van. Nick has seen similar marks before when he was working in Liberia and he has an idea who may be responsible: a man name Victor Mowende. He’s a practitioner of a type of an African voodoo called Uthalande and the last time they met, five years ago, Mowende tried to have Nick killed. Unmarked Graves is a very dark story and the very first page begins with a mutilated body in a bath. 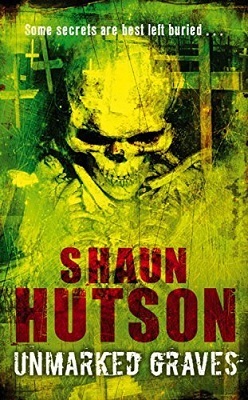 Shaun Hutson is a writer with excellent descriptive skills so I would not recommend the book to readers who are squeamish or faint of heart. If you are already familiar with Hutson’s work though, you will have an idea what to expect. I would not say that any of the characters in Unmarked Graves are particularly lovable. They are okay, but I never grew to care about them a great deal and I consider Unmarked Graves more of an idea-driven book than a character driven one. It is a scary book though. My favourite scenes occur in the final chapters when Nick and Bishop are exploring some condemned flats that are situated at basement level underneath the flats where the refugees live. It’s dark down there and, although the décor is bad, the smell is worse and the creatures that are causing that smell are the stuff of nightmares.